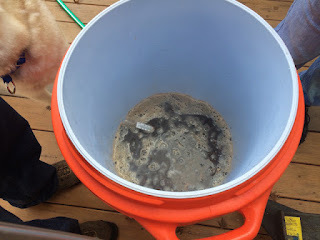 Our first brewing experience was a partial mash and mostly watching. Our friend, who has brewed for many years, showed us the ropes with our stout kit. It was good to see the more advanced processes because it first, gave me an idea what it takes to brew, but secondly I was able to separate the simpler processes of steeping and know what I needed to perfect before moving on the partial mash myself. Seeing the use of the mash tun and the temperature requirement was a bit intimidating. Certainly it was very difficult to hit a target temperature from a kettle to a mash tun. 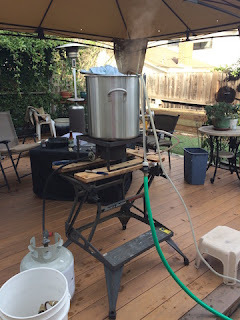 But our friend showed how he used BeerTools to calculate the temperature of the kettle with the distance in tubing from the kettle to the mash tun and the temperature of the grains, to get the mash tun the right temperature. Nevertheless, I happy to wait a while before I tried a mash tun on my own. After hitting our target temperature, we got out the sparge and got a good grain bed to make some good wort. 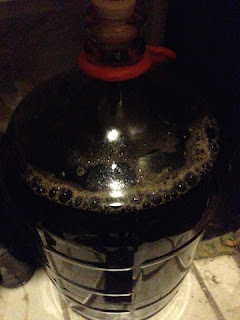 After boiling, doing the hop schedule and chilling, we popped it into the carboy and waited for fermentation. The original gravity came out on target, but the final gravity was a bit high. Our friend has a fermentation closet, and given this was December, his closet was in the low 60's. So we let the carboy sit for two weeks. We should be thankful that 2014 was a very mild winter or else the closet may have been better for a lager. Even with the beer a little sweet, it turned out pretty good. Nice character and enjoyable. 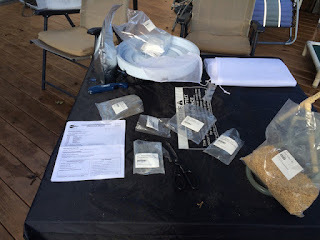 It left a good impression in my mind and my wife and I processed to purchase a starter kit from MoreBeer. With the kit came an Amber recipe, so my first brew recipe was set.